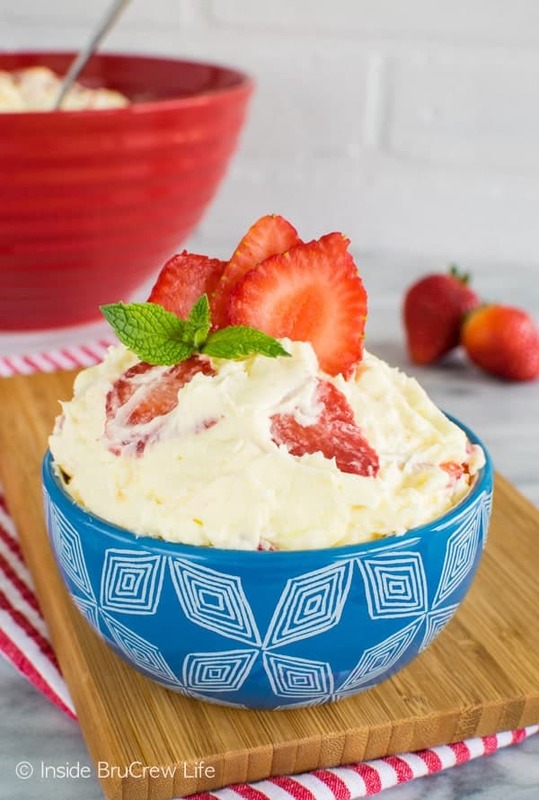 This creamy Strawberry Lemon Cheesecake Salad is full of fresh berries and lemon flavor. 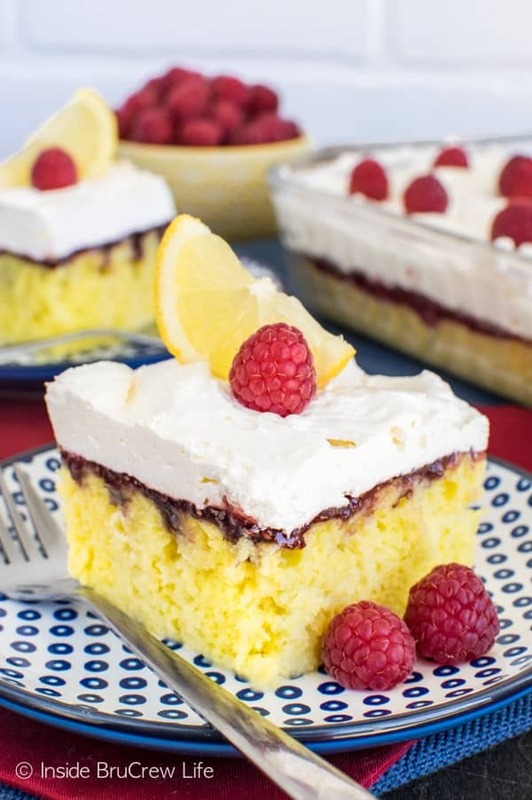 It is a delicious side dish or dessert to share at the upcoming picnics and parties. I wish I could be one of those people that loves to eat salad all the time. Plates full of green leaves and veggies are ok for a while, but then I start to get tired of them. Just pass me the plate of brownies and some ice cream, please! It’s a really good thing I have developed a good workout routine with my bad attitude toward salad, otherwise my jeans and shorts would be revolting about now. I think this means I just need to rethink my salad strategy. Time to add some new veggies, dressings, and proteins into the mix. Any ideas for me? Our old stand by salad’s are not cutting it anymore. 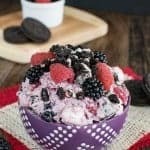 Last year I made this banana split fluff salad, and I realized that dessert salads are my favorite way to do salad! 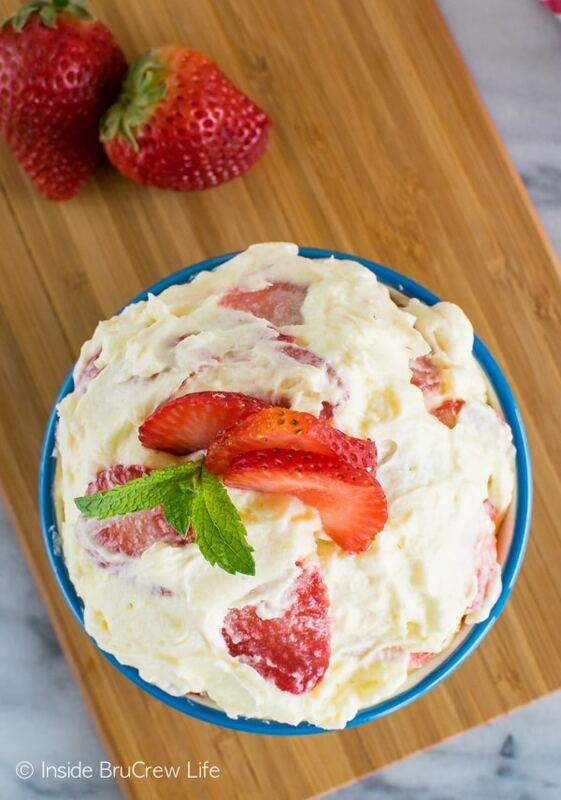 Creamy, fluffy goodness loaded with lots of fruit is definitely my favorite way to eat “salad”. The last few dessert salads I have made use pudding for the base, so for this one I wanted to change it up slightly and use cream cheese and a can of pie filling in place of the milk and pudding mix. You would think after writing an entire book about cheesecake recently, that I would be staying clear of that type of dessert. It’s actually just the opposite. I did take a few weeks away from cream cheese, but then I just started cranking out more cheesecake goodness. 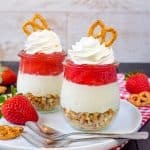 It truly is one of my favorite types of desserts to create! Really any pie filling will work in this salad, but every since making and eating an entire batch of the best lemon bars ever, I am all about the lemon goodness. The red berry slices made the salad look so pretty and festive in my red bowl. 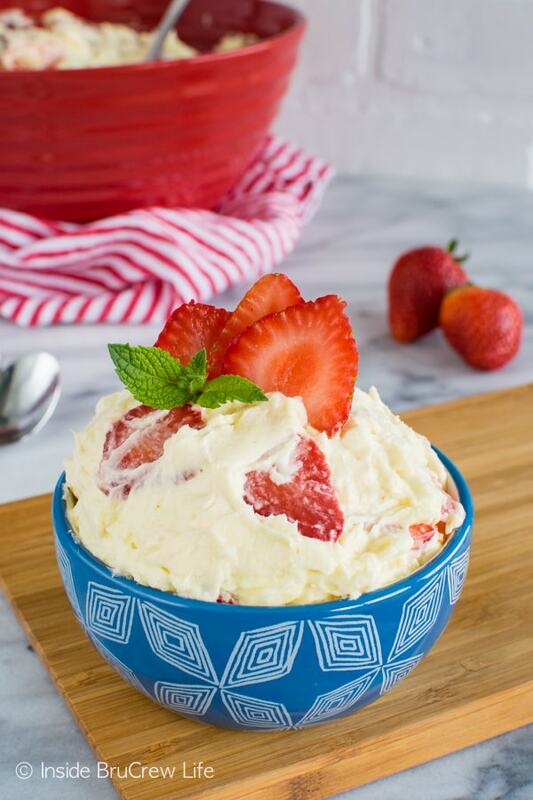 If you add some blueberries into it too, this would have the perfect 4th of July side dish! The lemon isn’t too bright, so it really does look like red, white, and blue! Make sure your cream cheese is soft before you start mixing it. I like to get it out of the refrigerator at least an hour ahead of time. If you forget, go ahead and unwrap it and microwave it for about 20 seconds to warm it up. After the cream cheese is very creamy, add the pie filling and beat again until creamy again. Fold the Cool Whip in gently. You do not want to beat it and release all the air from the mixture. 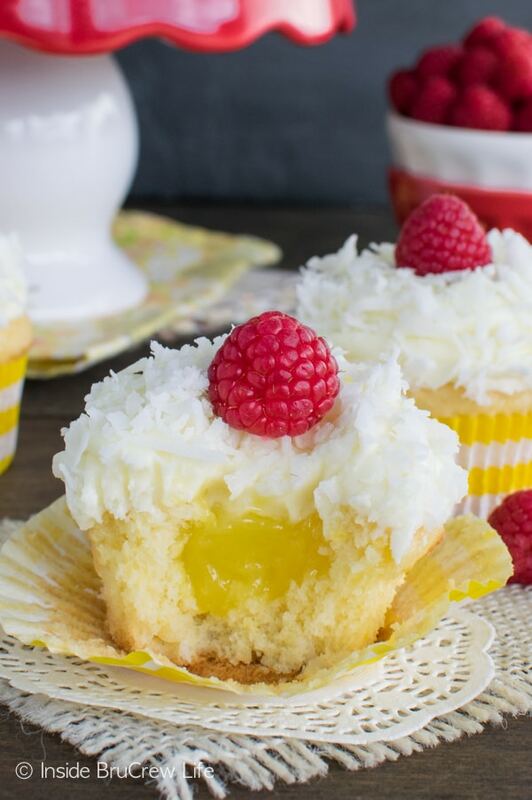 You want it to stay light and fluffy. Stir the strawberries in carefully too. Mixing too hard can make the fruit break apart and add too much moisture into the mixture. Add blueberries if you want a pretty red and blue dessert for the picnic tables. 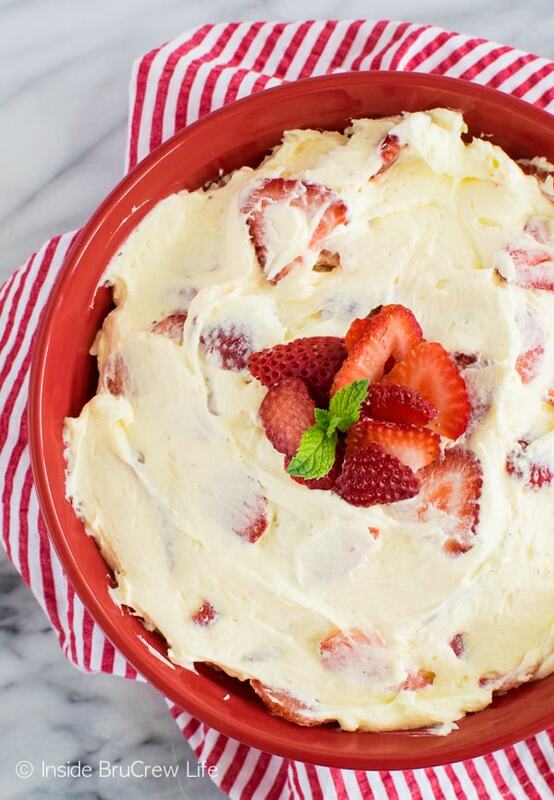 This creamy Strawberry Lemon Cheesecake Salad is loaded with plenty of fresh berries. 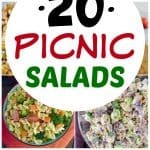 This is the perfect side dish to add to any picnic or party. Fold in the Cool Whip gently. Stir in the strawberries carefully. Chill covered in the refrigerator for at least an hour or two. Makes about 6 cups. 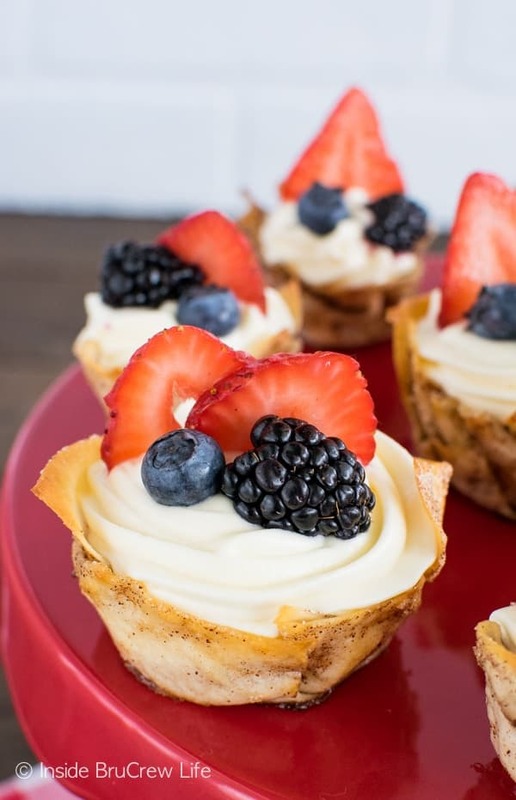 *Add blueberries to the mixture to make it a fun 4th of July dessert salad. 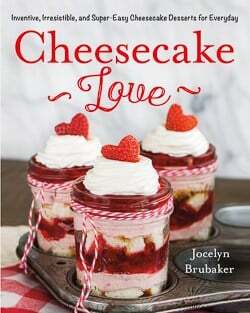 Cheesecake is my favorite dessert- this looks wonderful and takes minutes to put together, love it! Oh my goodness, this looks like heaven! 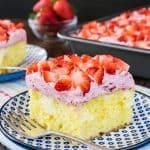 Strawberry lemon is one of my favorite summer combinations! 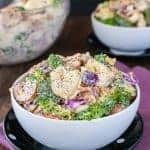 What a perfect salad for this weekend! This is my kind of salad! What a great dish to bring to a BBQ! Could you add white mini chocolate chips and grumbled graham cracker on top?? Also how can we make it a little bit creamy not so thick? Have you made it yet? It really isn’t thick at all. It is a very light and fluffy mousse. 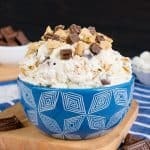 And crumbled graham crackers and white mini chips on top sounds awesome! could you substitute grapes for the strawberries? I guess you could…I’ve never done that. I think blueberries would be better though. how many strawberries to buy to make 4 cups?